Winnie the Pooh is often presented to babies as it is so cute and now your newborn can be dressed in bodysuits that have Tigger on them. This pack of 3 baby bodysuits all have Tigger on them but all look different. One snapsuit is orange with the head of Tigger while another one is white with blue stripes and many heads of the fun tiger and the last one is white with Tigger bouncing around and the words “Born to play & bouncing”. These cute bodysuits come in sizes 0 – 9 months and are made from 100% cotton and have round snaps on the bottom for easy changing of diapers. Now your baby can look amazing and be friends with Tigger from Winnie the Pooh at the same time. This boy’s romper has white and blue stripes with an orange collar and on the front a big picture of a bouncing Tigger. A bodysuit like this will make you child even look cuter then you know it does. You can get this 100% cotton bodysuit in many sizes so that you can get the size you need. The snapsuit has little legs but still the snaps close will make this perfect for changing a diaper on the go. If Winnie the Pooh and his friends are one of you favorites then this Christmas ornament would be a great addition to your Christmas tree this year. 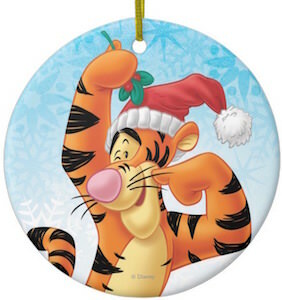 This ornament shows Tigger and he is wearing a Santa hat and holding mistletoe above his head. This Tigger ornament is made from ceramic so it really looks nice and comes with a gold thread to hang it. And the ornament on the picture is round but it is also available as oval, star, heart and t-shirt shape so that you can pick the one you like best for your tree. If you are looking for a Winnie The Pooh lunch box that has Tigger on it then you can stop looking as this is the one you want. 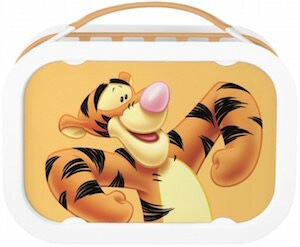 This Tigger lunch box shows a nice picture of Tigger ready to bounce around. 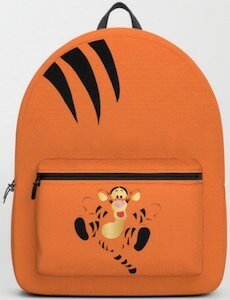 Inside the Tigger lunch box you will find and ice pack, sandwich box and snack boxes. Other accessories are also available for this Winnie The Pooh lunch box. And besides kids even parents will love this lunch box as it is super easy to clean and most parts even can just go in the dishwasher. 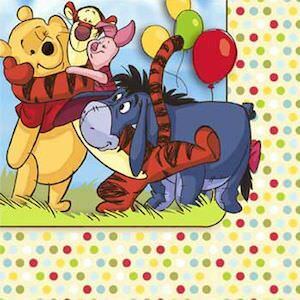 “Bouncing is what Tiggers do best”. 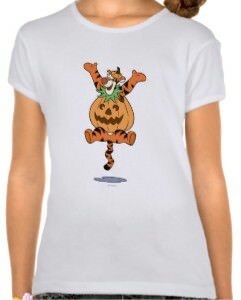 Now you can have your very own bouncing Tigger on a t-shirt for everyone to see. This officially licenced Disney shirt has the image of Tigger wearing a pumpkin as a costume and he is bouncing up and down. You can see Tigger’s distinctive orange and black stripes and springy tail. Tigger is wearing a hat made of the top of the pumpkin and has a green pointed collar around his neck. This shirt comes on all sizes from infant to adult and in almost any color and style that you can think of. Wear this shirt as a costume for a party or on Halloween or anytime to express your love of Tigger. 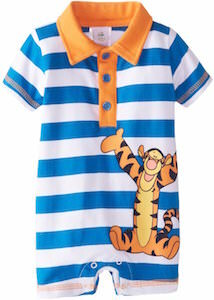 Show the world who your favorite Winnie the Pooh character is by getting this Tigger in Pumpkin T-Shirt. Now when your baby had a bath you can role them into this super cute Tigger bath robe. 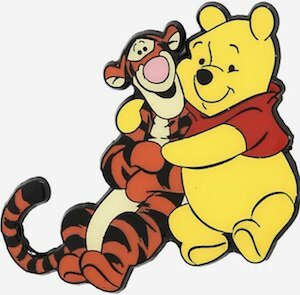 And yes Tigger the friend of Winnie the Pooh loves kids and loves it when they wear his bath robe when they are all wet and clean. 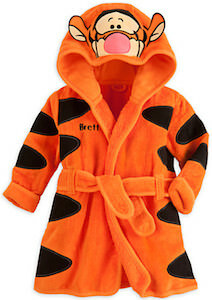 This Tigger bath robe is orange just like Tigger and has all the spots you expect to see on him. 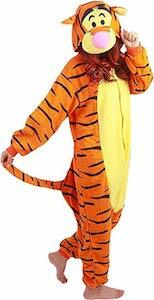 And the hood has the face of Tigger embroidered on it so that it really looks like this Disney character. This Tigger bath robe is made from 100% cotton to give your baby a warm and soft feel.